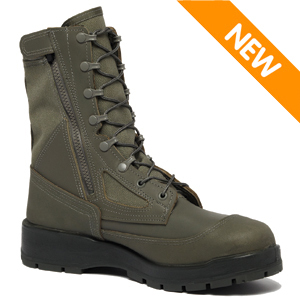 The Belleville 630Z ST Maintainer USAF Hot Weather Steel Toe Zipper Boot was designed specifically for Air Force personnel working on the flight line. A steel toe protects your feet from falling objects and is a must around tools, machinery, and aircraft. Belleville added a convenience side zipper which gets you up and going in seconds. A patented smooth sage green leather allows you to wipe away chemicals and oil to keep your uniform looking sharp at all times. This boot features Belleville's Vanguard running shoe system for an extremely comfortable feel and fit that will pay dividends during long duty shifts and extended wear. The 630Z ST is Berry Amendment Compliant and made in the USA with pride.